SeaFest, Ireland’s national maritime festival, took place in Galway on Friday 30th of June to Sunday 2nd of July. For information on the events that took place as part of SeaFest 2017 please visit the official site. A number of photo taken over the 3 days of the festibval are available in the Gallery section of the SeaFest site. 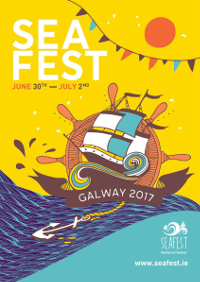 The ‘Our Ocean Wealth Summit’ took place in Galway as part of SeaFest 2017 and was sponsored by PwC Ireland. Photos and vidoes from the Summit are available in the Gallery section. For information on other events that took place during SeaFest please click here. Photos from a number of SeaFest related events are also available in the Gallery section.